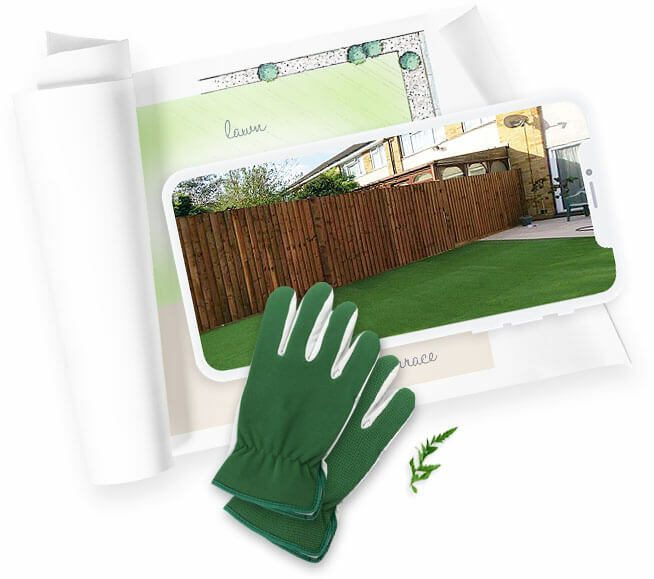 Creating a garden beyond what you could have dreamed is what Handy Gardeners are about! All of our landscaping projects begin with a call to our office and a preliminary conversation between our staff and the client. 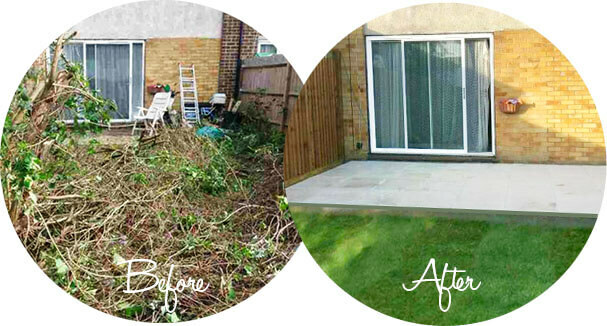 As you would most likely guess not all clients are always certain of what they are looking to have done to their outdoor space, especially if it is a large garden that had not been tended to for a long time as it was the case with the outdoor area we had recently transformed in Feltham, TW13. As the saying goes, behind every beautiful garden lies a well drafted and perfectly executed plan of action. And the large-sized garden we just finished working on in Feltham, TW13 is just one of the examples for a garden landscaped to perfection. 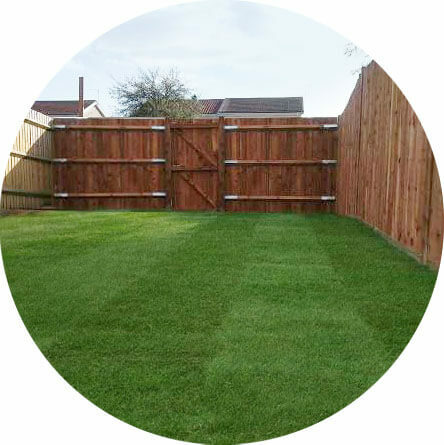 It was a multidimensional project that covered everything from re-turfing with natural grass, patio laying and pathway building and fencing to complete garden clearance preceding it all. Re turfing with natural grass - 54 sq.m. Pathway laying - 14 sq.m. Patio Laying - 14 sq.m. 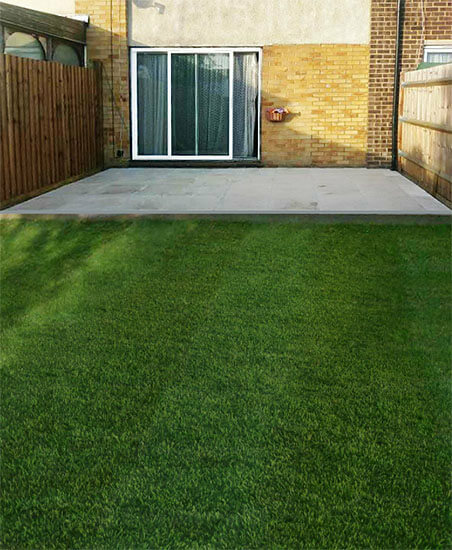 To ensure that all of the client ideas are discussed and are taken into consideration, we would send one of our experienced landscapers on a field survey as we did with this project in Feltham. It is very important for any client to be heard and listened to carefully so that we would provide them with the absolute best customer service and end result. Upon arrival at the property at the agreed and convenient for the client time, our landscaper takes note of all ideas and most importantly takes measurements of all areas that are to undergo a makeover. Photos are taken from various angles so that all gathered information is prepared and handed to our team of web designers that prepare a graphic visual with the final design of the given idea (if such is required) and for the landscapers to map out the work. On the day scheduled for the start of the project in TW13, our handy landscapers began with delivery of all the necessary materials, which consisted of turf rolls, bags of top soil, 15 sq.m lawn edge, fertilizers and compost, slabs, sharp sand, cement, timber joists, posts, fence panels, three bags of gravel and paving slabs. After all the materials have been delivered and prepared the landscaper could start with tidying up and preparation of all areas individually. 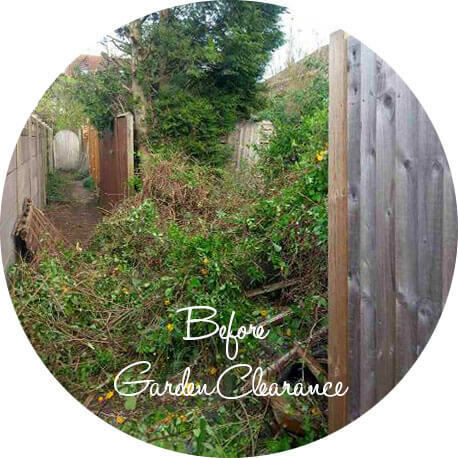 The garden in Feltham was in a much neglected state, so all the unnecessary vegetation and all items no longer needed were removed and the entire outdoor area was cleared out. 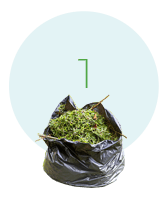 It took two and half days to our team to completely clear out the garden and prepare it for the actual work. All areas were leveled out and prepared according to the work that would be carried out. 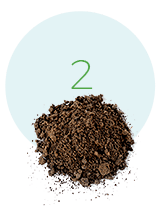 Our landscaping team started with rotovating the soil where it was necessary, so the terrain was perfectly leveled at the end of the preparation phase. The largest component of this renewed outdoor space as you can tell is the laying of the new grass. 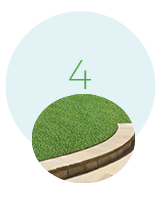 Fifty four square meters of the existing terrain were laid with fresh, natural turf. Onto the leveled, bare ground, the landscapers applied top soil and a thin, aggregate layer of crushed stone at this particular London garden. 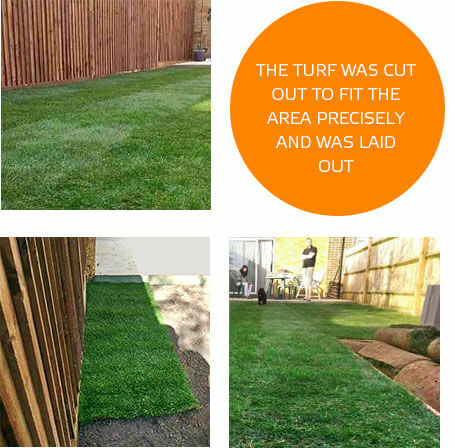 The turf was cut out to fit the area precisely and was laid out. 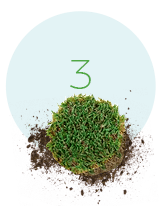 Before the lawn was installed, minerals and fertilizers were put onto the grass to stimulate its healthy growth followed by instructions to our clients on how to care for the new lawn. An area of fourteen square meters was meant for laying a new patio down. 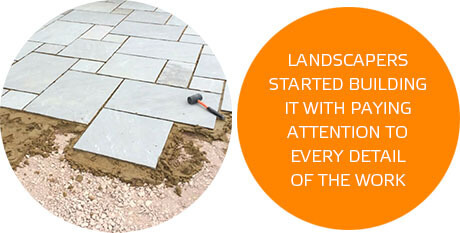 Our landscapers started building it with paying extra attention to every detail of the work process. After the ground was cleared form debris, leveled out and mapped, a sub base was then created from MOT stones with cement. The slabs were put down carefully and fixed with a mixture of sand and cement. The gaps in between were filled (a process called pointing). After our handy specialists were done, a fresh laid patio and a pathway were installed. 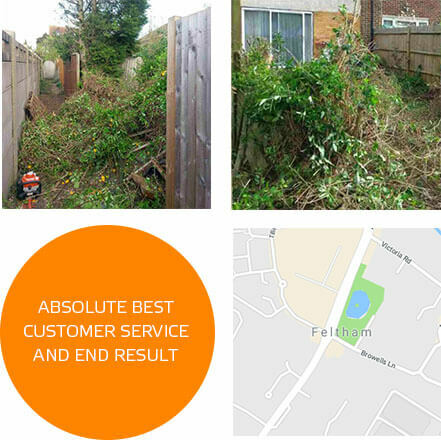 This project we worked on in TW13, Feltham did not just entail the renewal of the ground but it also called for a new, better looking fence to be erected. 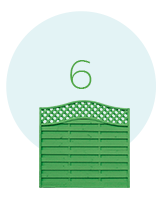 They opted for the feather edge fence style to be used along with the installation of a new garden gate. 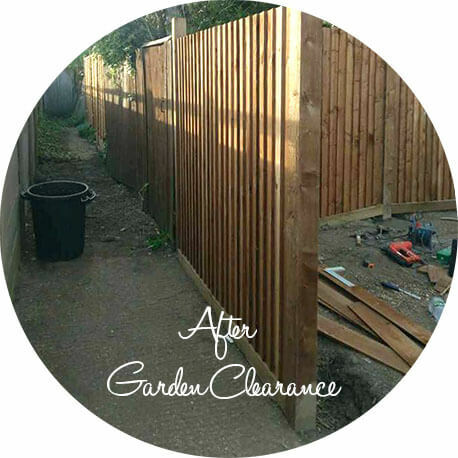 A new, properly erected fence provides the privacy, security and finished overall look of the garden and our happy customers from Feltham, TW13 could enjoy all of these benefits after we were done with installing it. Completion of any landscape project comes with the satisfaction of the clients and a beautiful outdoor space tailored for them to enjoy all year long!